Forrest Gump is a 1994 American comedy-drama film based on the 1986 novel of the same name by Winston Groom. The film, directed by Robert Zemeckis, stars Tom Hanks, Robin Wright Penn, Gary Sinise, Mykelti Williamson, and Sally Field. The film tells the story of Forrest Gump's epic journey through life meeting historical figures, influencing popular culture, and experiencing first-hand historic events of the late 20th century while being largely unaware of their significance, due to his borderline mental retardation. The film differs substantially from Winston Groom's novel on which it was based. Filming took place in late 1993, mainly in Georgia and North and South Carolina. Extensive visual effects were used to incorporate the protagonist into archived footage as well as for developing other scenes. An extensive soundtrack was featured in the film, and its commercial release made it one of the top selling albums of all time. 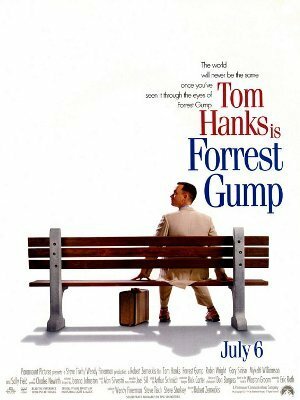 Released in the United States on July 6, 1994, Forrest Gump was well-received by critics and became a commercial success as the top grossing film in North America released that year. The film ended up earning over $677 million worldwide during its theatrical run. The film garnered multiple awards and nominations, including Academy Awards, Golden Globe Awards, People's Choice Awards, and Young Artist Awards, among others. Since the film's release, varying interpretations have been made of the film's protagonist and its political symbolism. In 1996, a themed-restaurant opened based on the film, and has since expanded to multiple locations worldwide. Although a screenplay was developed on Groom's second novel, as of 2009, no sequel has been officially greenlit.